What do you do when a three-year-old with autism falls on the floor kicking and screaming? How do you communicate with a child who looks away and flaps his hands? Who can help if you suspect a child in your class has autism? Preschool can be overwhelming for a child with autism. Autism affects how a child communicates, behaves, and relates to others. Teachers need to know what they can do to help children with autism reach their full potential. Teaching Young Children With Autism Spectrum Disorder is a straightforward, easy-to-understand guide to working with children who have autism. It explains the major characteristics associated with autism and helps teachers understand the ways children with autism relate to the world. 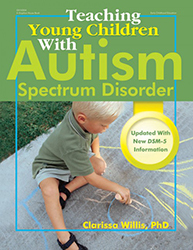 Each chapter offers specific strategies for teachers to use, including setting up a proactive preschool environment, helping children learn life skills, managing behavior, helping children with autism communicate, encouraging children with autism to play, helping them to get along with others, and working with families. Teaching Young Children With Autism Spectrum Disorder helps teachers connect with all children in meaningful ways, allowing children with autism to learn and grow.